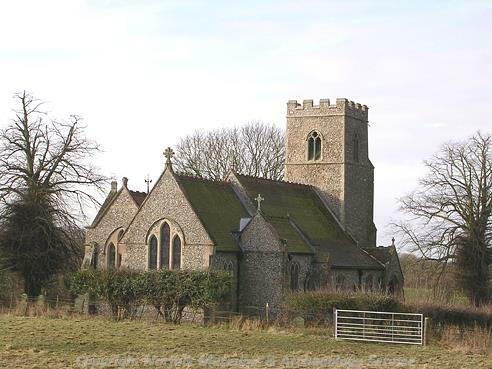 Thursford is a small parish situated 13km from the coast, in the Local Government District of North Norfolk. The parish has an area of 600 hectares, and contains Thursford Wood, one of 38 sites looked after by the Norfolk Wildlife Trust, the oldest wildlife trust in the country. The name ‘Thursford’ is thought to derive from the Old English for giant or demon’s ford. The earliest recorded objects are a number of pot boiler flints (NHER 35054) recovered from Brookhill Plantation. A number of prehistoric worked flitns have also been recovered (NHER 45420), as well as a Neolithic polished flint axehead (NHER 2093) and two Middle to late Bronze Age palstaves (NHER 2158). Unfortunately no archaeological features or finds from the Iron Age have been recovered, but a small number of Roman objects have been recorded, comprising some coins (NHER 42639, NHER 45415) and a pendant (NHER 45420). No features from the Roman or Saxon period have been discovered, though an Early Saxon brooch (NHER 45420) and a Late Saxon mount have been noted. Despite the lack of Saxon period settlement evidence the Domesday Book does list Thursford, and values it highly, no doubt due to the important managed woodland of Thursford Wood (NHER 49113). The wood is now the home of some of the oldest oak trees in the county, as well as offering a haven for a stunning array of wildlife in its wood pasture and ponds. The oldest standing building is therefore St Andrew’s Church (NHER 2159), a delightful building that was heavily renovated in the early 1860s, but retains its original north door of around 1200 and west tower of the 14th century. In the rest of the parish a few cropmarks and earthworks have indicated the course of former medieval field boundaries (NHER 32227) and hollow ways (NHER 32866), as well as the site of three or four medieval moats (NHER 32228). A small number of medieval objects have also been recorded, and these include pottery sherds (NHER 18291), a buckle (NHER 40794), jettons (NHER 42695) and a coin (NHER 45420). Similar objects from the post medieval period have also been retrieved, as well as a coin weight (NHER 40794) and a pottery chicken feeder (NHER 18291). Thursford also retains a few post medieval buildings of architectural interest, including Odd Nos 5 to 11 Clarke’s Lane (NHER 33480), a terrace of early 18th century cottages, and St Andrew’s Rectory (NHER 47228), a mid 19th century rebuild in Tudor Gothic style of an earlier barn. Also of interest is the site of Thursford Hall (NHER 2175), an Elizabethan building that was demolished in 1918, leaving behind a wing of the 16th century, a 17th century stable court and a barn with gothic tracery. The Village Hall (NHER 33481) is also of note, having originally been a 17th century farmhouse before conversion in 1850 into a school, and later development into the current single-storey hall form. From more recent history the Midland and Great Northern Joint Railway (east to west) (NHER 13581) line also ran through this parish, opening in stages between 1865 and 1933. The line itself is now completely closed, but during its operation there was a station in Thursford. Its existence is now remembered only in the names of buildings such as Station Farmhouse (NHER 47385). World War Two also left its mark, and a pillbox, spigot mortar gun emplacement, and at least one Home Guard shelter or station (NHER 30787, NHER 32415) are situated here.